Our latest endeavour has been to build and design a completely new website for The European Association for the Study of the Liver (EASL), a non-profit organisation based in Geneva, Switzerland. 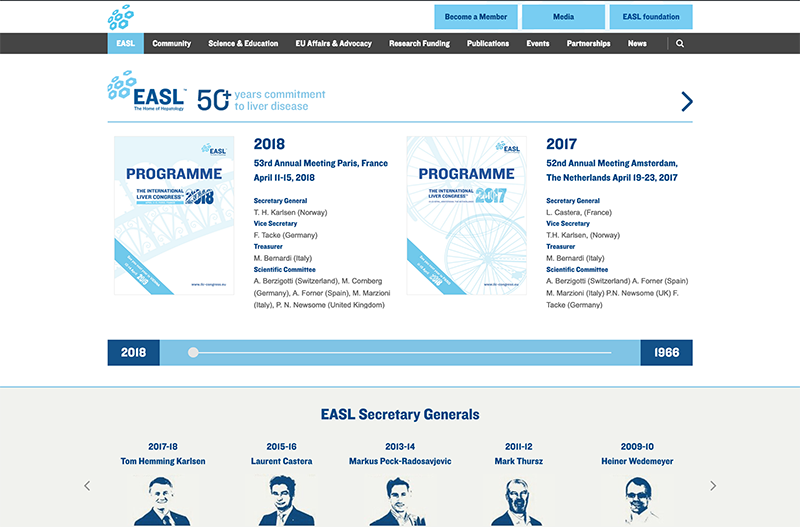 We have been working closely with the team at EASL since 2014 on a number of their major events and projects, such as the annual International Liver CongressTM. We’re continuously customising and evolving their sites to meet the growing needs of the organisation, as well as providing ongoing support and training. We were thrilled when EASL approached us to take on their biggest website project to date! We believe the website is sophisticated enough to meet EASL’s criteria yet also friendly and approachable. We’re extremely happy with the site and what we have delivered. The new website really demonstrates the success and growing importance of the Association and we’re excited to continue to work closely with EASL to maintain and support the team.